Soap Makin’ with Old Town Suds: Plus, Giveaway & Discount! As a natural product junkie, I’m curious about what goes into my beauty, bath and skincare purchases, all the way from ingredient sourcing/origins to process and packaging. So, naturally, (had to, sorry) I jumped at the chance to attend a soap making class led by the Owner and “Chief Sudsologist” behind a local, natural soapmaking company that I know, use and love: Old Town Suds. I’m excited to share my soap making experience here on Unsullied, and Old Town Suds was generous enough to offer a freakin’ fabulous giveaway of their products, plus a discount code to use on their classes, beautiful soaps, and other beauty and skincare essentials. Read on for all of the sudsy goodness! When I saw that Steffanie was offering soap making classes ($50 for a one hour class), I thought, yep, this is the type of gal I want as an instructor! So, t’was a sunny Saturday that I drove out to the Old Town Suds soap making kitchen (a whole floor in Steffanie’s house) in Virginia. And it was glorious. And yielded me a full pound of custom, sweet, woodsy smelling soap. It’s the current Unsullied soap of record, y’all! So, how do you even make soap? Most people who have seen Fight Club know that it involves lye (and human fat cells…just kidding. That’s movie fiction!…right?). The basic gist is lye (sodium hydroxide) + water, mixed with oils/solid fats (think almond, olive, etc. oils + shea butter or cocoa butter, etc.) = saponification = SOAP! We started off the class by peeping at Steffanie’s soap curing racks for a bit of inspiration. (Cue the “oooohs” and “aaaahs!”) This is a soap enthusiast’s dream. 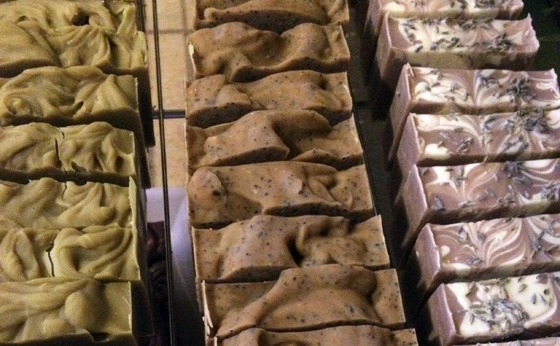 Steffanie had all types of artisan soaps in a rainbow of colors and beautiful textures and swirls – beer based, charcoal face cleansers, shampoo bars, and even a “tingly” bar made with sriracha!…don’t mind if i do. You can check out her assortment on the Old Town Suds online shop. After drooling over Steffanie’s creations, we set off to make our own. 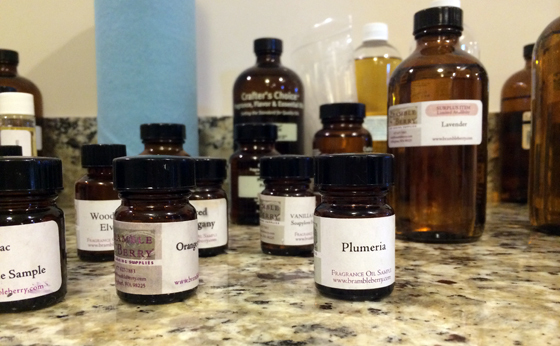 We began by browsing Steffanie’s seriously colossal collection of scented oils to give our soaps that special somethin’. I opted for a mix of essential oils, and with Steffanie’s guidance and suggestions, settled on a blend of grapefruit, rosemary and tea tree oils. This yielded a woodsy, subtly sweet scent that I LOVE. Bonus: of the many benefits of tea tree oil, it has skin-clearing properties. Next up: we had the option to select a clay to add some color to our soaps. Yes, please! Steffanie had a great selection, from shades of greens, purples, pinks, neutrals and more. I couldn’t say no to her rose clay: since I was scenting my soap with grapefruit essential oil, is only seemed suiting. Plus, it’s pretty! After that, we strapped on mad scientist goggles and the real science of soap making began. What follows is the hardest part about soap making: WAITING FOUR WEEKS to lather up with ‘em! Soap has to cure after it’s been mixed and cooled in order for the water to evaporate. This creates a harder bar of soap that lasts longer and offers sufficient suds. After getting my one pound tub of soap home, I sliced it into bars after about 24 hours, and now have them laid out to cure for the next four weeks. I’m literally watching over the bars like a mother hen (but not sitting on them) - and I’m so pleased with my pink, swirly bars that resulted from Steffanie’s class! As soon as I hit the four week mark, those babies are going in my shower. And I will REJOICE. Despite the waiting game, Steffanie gave us a bit of instant gratification at the end of class: all of her students were invited to pick out one of her lovely soaps to take home. Hallelujah. I went with her favorite, the Dry Skin Buster. Detox Bath Champagne – a brand new release from Old Town Suds! Bar soap of your choice! Steffanie has also offered up a discount code so that you can get whatever you want from her shop, or sign up for one of her soap making classes. Use code getunsullied to receive 15% off Old Town Suds orders over $25. The code expires on April 15, 2014. As Steffanie would say…stay sudsy! Not going to lie, I’m a LITTLE excited about our first giveaway. (Understatement of the century) Thanks for entering, Moll! Sounds awesome! I’d love to find somewhere here to take a soap making class I’ve done lots of reading/research, so I get the how-to’s, but the lye part makes me nervous to just go it alone the first time. I think I’d choose the Dry Skin Buster, but Smell the Rainbow has me intrigued too! 100% agree with you – when I first read up on how to make soap, I figured I’d blow up my kitchen if I tried do it by myself. The class experience was much better! Thanks for the comment! Wow, sounds like I have to try a soap-making class! In terms of what bar, hmm…I think the Alexandria Beer Soap would be cool! Thanks for this giveaway! Great pick + good luck! Thanks for entering. I’d choose dry skin buster This all looks amazing! That class sounds positively delightful! And the soap sounds marvelous. 4 weeks?! Sounds like some kind of torture to me! Seriously though, I’ve never made soap and it sounds like alotta fun. I reckon I’d pick the Luscious Locks bar as I’ve been searching high and low for a decent shampoo bar. Oh boy, my heart is racing this sounds so fun! II visit Virginia a lot (my boyfriend lives there) so maybe I can visit Old Town Suds for a class next time The soap you made looks amazing and I love the story behind the company. Mmm the Sweet Rose soap sounds lovely. Great post! SO awesome! My sister just walked past my laptop as I scrolled over the photo of your oh-so-pretty pink bars and said ‘ooooh what’s that?! looks so pretty!’. Sounds like you had an awesome time! That is the highest compliment of ALL. Haha, thanks, Amber! OOH SORRY! I would choose Peppermint Surprise! Really interesting post! I ‘m glad you enjoyed the soap class! I’d LOVE the chance to take the class it looks like a blast! I think I would choose the Japanese Citrus bar. I love lemongrass, so Spring Breeze would be my top pick! Thanks for this giveaway, the soaps look so awesome! Thanks for commenting + entering, Ru! Old Town Suds’ lemongrass laundry detergent smells all types of lovely…bet the soap is great, too! 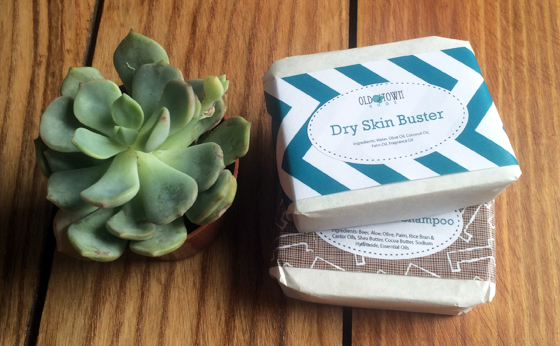 Dry Skin Buster sounds amazing! Great pick, IT IS! I have it in my shower right now and am loving it! I am so glad she is doing so well with the soap process! I would love to try some! The dry skin bar is probably what I need at this point…. I got my girlfriend a “how to make soap” zine at some point, but we haven’t tried it yet! This is terrific. I think I need that zine. Good luck with your project! I’d definitely pick the Dry Skin Buster. I am one of those weirdos who has dry skin all the time, even in the summer, even in the South! Ohh, I love the pink soaps you made! The course sounds amazing, I’d love to go on something similar here in the UK. Came here via a comment on my blog, thanks so much for stopping by! Oh, and I’d probably go for… arrr…decisions… the Lemon Verbana, I think. Mmm. I so wish I lived close to Stephanie, I’d make soap every weekend- if she’d let me. I’d like to try the champagne detox thing! That sounds so cool to become a ‘sudsologist’. 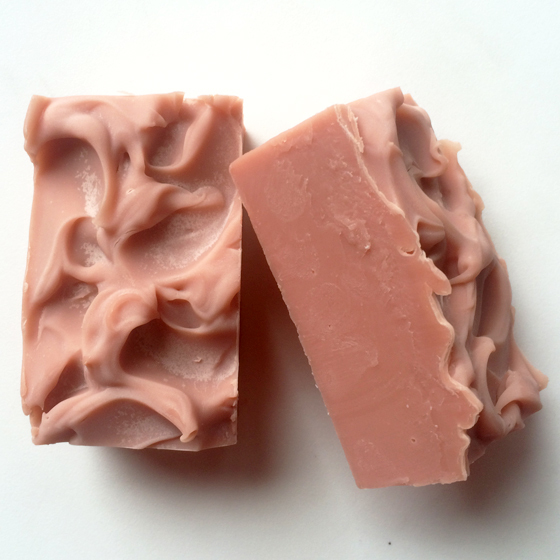 I love natural based soaps, you can’t be too careful about what you put on your skin. Would the guys be attracted to the scent of the beer based soap?